A lot is happening in the Rx Market this year. In case you missed it, Aetna has been purchased by CVS health, which has been approved by the DOJ. As part of this purchase, however, they have to sell Silverscript, the Medicare Rx Program. This is set to happen around the first of the year, to WellCare. In the meantime, Silverscripts prices have gone up and Aetna looks much more competitive, and we expect a lot of changes this year. Walgreens bought Rite Aid and is in the process of consolidating stores and plans. No word yet on what will happen to Rite Aids’ Envision Rx program, and Walgreens has maintained its deal with AARP. It is important that Seniors check their prescriptions EVERY year, as this is the time of year when everything changes. It is too late to change in January when you discover your medication is no longer covered! 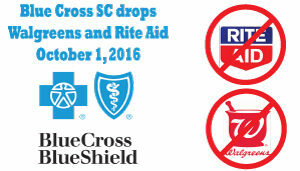 Effective October 1, 2016, all Blue Option individual and family plans under the Affordable Care Act (ACA) will be covered by the Advanced Choice Pharmacy Network. This is an exclusive pharmacy network impacting current members, as well as members with new plans sold with effective dates October 1 and beyond. Exclusive pharmacy networks are a necessary step toward controlling prescription drug cost increases that continue to trend upward.